Fireplace Supplies, Grill Supplies, Fire Pit Supplies and More! Looking for grill or fireplace supplies? Want to know where to buy a new fire pit, naturally raised goat meat, whole hogs, whole pig rotisseries or fireplace cooking equipment? I get dozens of emails a month asking me where to get many of the things I show and discuss online. I don't sell anything myself, but I do know of lots of great sites online that carry great stuff. Below is a great big list of various online merchants who specialize in all things fire. So if you are jonesing to get your grill on, or absolutely need a big ol' rotisserie right away, or just want to get a spiffy new set of fireplace tools, this page will help you find it. I've unfortunately recently removed most sites because several have gone out of business. :( SpitJack is still there and still one of my favorite sites for all things fire. Just click on the banner or the blue text links to be taken to their site. Don't worry, they will open in a new window so you can continue to browse my site and other grill supplies. However, there are a few specific grill, fire pit and fireplace supplies featured on my site that I get the most emails about. I've listed them at the bottom along with links to where you can find them. If you can't find what you are looking for, contact me and if I have any further leads I'll try to help out. If you've read my site at all you have probably noticed that SpitJack.com is my absolute favorite supplier for fire-related paraphernalia. Why? Because they have so many unique and excellent products that you simply cannot find anywhere else. In particular, fireplace supplies for cooking like fireplace rotisseries and grills are unique and functional. They also make some of the best whole animal rotisseries in various sizes and have lots of other grilling, fireplace, firewood and fire pit supplies. Rotisseries for Whole Hog, Goat or Lamb: All of these shown on this site can be found at SpitJack.com. Fireplace Cooking Supplies Including Fireplace Rotisseries and Grills: All of these shown on this site can be found at SpitJack.com. Sojoe Firepit and Rotisserie: These can also be found at SpitJack.com. 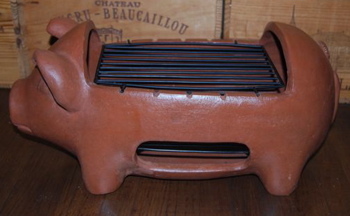 Terracotta Pig Grill: I get more emails about this cute little pig grill than just about any other thing on my site. They used to be carried by Cost Plus World Market, but I have not seen them there for years. Unfortunately, I think these are nowhere to be found. I apologize. There are other terracotta grills available from various sources if you search online. If you find a source for the pig grill or anything like it, please let me know! Return to the top of the Grill, Fire Pit and Fireplace Supplies page.